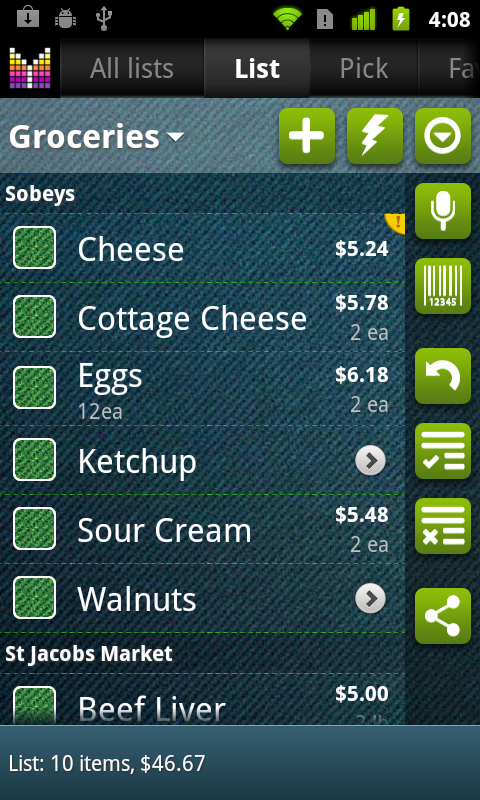 Lets get started with a few basic concepts which would help you use Mighty Grocery app efficiently. First of all, there is a Tab Bar on the top of the main screen. The current tab is highlighted and centered inside the tab. If you are on Lists tab, you may also see All lists, Pick and a piece of Favorites. Needless to say that clicking any of those tabs will activate them. The Tab Bar is scrollable. If you grab the Tab Bar and scroll it, several hidden tabs show up: History, Aisles, and More. Second, below the Tab Bar is a Toolbar which contains a few buttons of your choice and the Side menu button (upper-right corner). Long-tap the Side menu button to show Sidebar. Single click on a button will launch corresponding function like Add item, Voice recognition, Scan Barcode, or Quick Edit. Long clicking a button will move it from/to Sidebar. 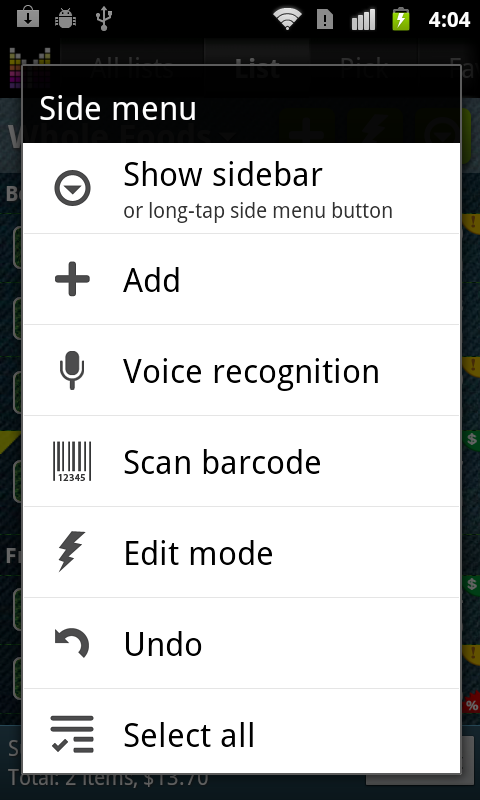 In other words, long click a button on the Toolbar to move it to Sidebar. Or long click a button on Sidebar to move it back to Toolbar. Note: Only combination of top 4 buttons can be moved to Toolbar from Sidebar (Add item, Voice recognition, Scan Barcode, or Quick Edit). 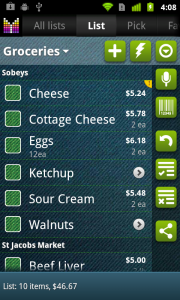 Third, single tap on Side menu button will show Side menu with all commands available in shopping list. It’s a great way to learn which icon corresponds to which action. Why not allow other buttons (undo, select all, etc) to be added so that I can choose my favorite 4 to be on the toolbar? It happened for historical reasons. We plan to allow more flexibility with toolbar and side bar going forward. I’ve tried several shopping apps, but not has worked for me, so I’m trying Mighty Grocery I entered all the items I need in my Grocery List. How do I sort them alphabetically (or alphabetically by aisle)? Stephen, to sort items by name and group by aisle please enable “Sort by name” and “Group by aisle” settings under Menu > Settings > Options > Sort options. 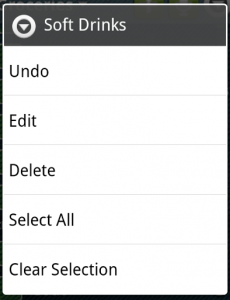 You can also enable these options individually for lists in Side menu > Sort and filter > disable “Use default sort options” > enable required sort options. Thank you for the quick response, Alex. How do I populate an actual shopping list that on top of telling me the articles I need to buy, tells me the shop where to buy each of them? Carlos, sorry, didn’t get your question. Could you please give a few more details? 4 – How do I get the program to show me a screen with exactly that information – Carlos, buy these 3 articles from shop A, these 2 from shop B and these 3 from shop C ? 1st, congratulations for the #1 app on the market and for the very dedicated support – simply magnificent! After trying MG for a few days I bought the paid version. Populated my articles, shops, etc., everything’s fine. Once I’ve got all the data in, how do I make my actual shopping list and keep the articles in their respective shops so I’ll be able to buy them again? I’ve tried long tap an item – yes, it goes in the Cart, but is deleted afterwards from its shopping list! I’ve read the FAQ and the User Guide but couldn’t find an answer! I suggest that under Getting Started, or Manage Shopping Lists, this theme (make a list of what you want to buy) should be specifically explained as, to be fair, is the main goal of the app. Hi Carlos, thanks for your feedback. There are multiple ways of adding items back to your shopping list. First is Pick list which contains all products ever added in the app. 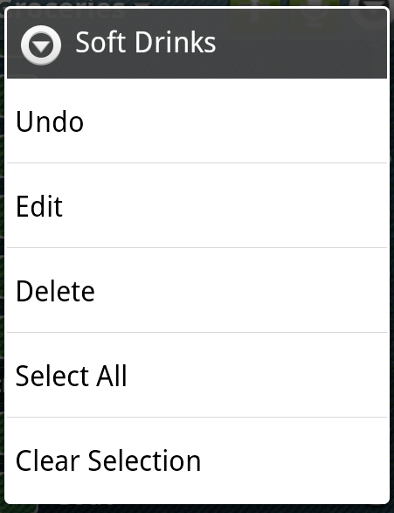 Second is Favorites list which needs to be populated in advance. You can add per-store favorites list and assign different prices. Finally, you may want to consider adding items from History or Pantry. Please let me know if you need any further assistance. Thanks Alex for, as always, a very quick answer – that’s something we highly appreciate. I’ll follow your advice. How can I recorder the headings I have in grocery list (deli, dairy, frozen, etc.)? I want them in the order I shop the aisles. There is no drag-n-drop available for headings, only for items. Mike, kindly note that it is possible to change aisle order under Menu > Settings > Aisles. Please see Manage Aisles User’s Guide for more details. I love this app, but can’t seem to get it to do exactly what I need. I’m wondering if there’s another way I should be thinking of my problem… Could you help me? Here’s how I intended to use it (perhaps its not the best way! ): When I work on paper, I have a master list of all the groceries I purchase at any given time throughout the year. I also have a list of prices, I call “base” prices, from one particular store. This store is my comparison store for all other stores’ discounts and sale prices. So, I need the ability to retain the price of every item at every store I shop at. Then, I expected to manually enter the discounts/sales and have the app compare the prices, telling me which other store I should shop at. In essence, the app seems to do the comparison great. But, what I’ve found is the inability to retain each stores’ prices. The picklist list ends up being modified and the next time I try to add the item to a store, it uses the last sale price, which more than likely isn’t in effect now. If there’s a better way to get someone to help me w/ this, pls feel free to refer me. I love this app and really want to make it work. Thanks! Jennifer, I guess list-specific favorites may help you. If you have a list for each store you shop at, then you could create favorites list for each store. Each list-specific favorite list will keep prices of that store and changes in other lists won’t affect this one.